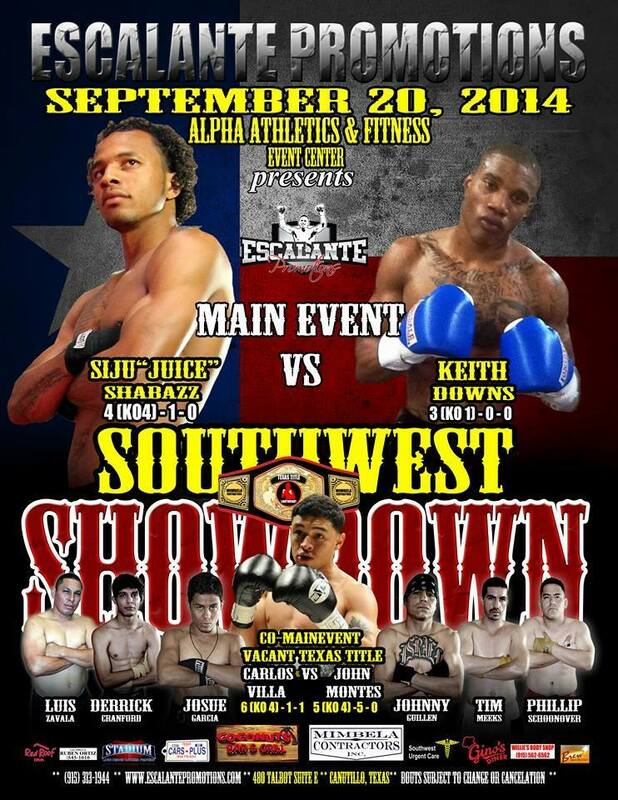 On Saturday night, Escalante Promotions is scheduled to hold an eight-bout fight card dubbed Southwest Showdown in Cantunillo, Texas inside the Alpha Athletics & Fitness Center. In the evening’s main event fans will get a very compelling bout between Las Cruces, New Mexico’s Sijuola Ade “Siju” Shabazz (4-1, 4KOs) and Texas’ Keith Downs (3-0, 1KO) at 165lbs. Shabazz was arguably the greatest New Mexican amateur boxer of all-time, winning seven N.M, Golden Glove Championships, three National Golden Glove Championships, and was a U.S. National Team Alternate. Downs made his professional debut in March. This past May, he took a fight on three days notice against 25 fight veteran Raul Casarez and stopped in him in the first round. Downs’ three professional opponents have a career record of 25-6 while Shabazz’s opponents combined for a 16-12-1 record. The co-main event pins Carlos Villa (6-1-1, 4KOs) vs John Montes (5-5, 4KOs) at lightweight. The victor will be awarded the vacant Lightweight Texas Title. In another intriguing bout, SWFight.com’s 2013 Mixed Martial Arts Fighter of the Year Kevin Croom (14-5 MMA record) will be making his professional boxing debut. Croom has no easy task against Las Cruces’ undefeated lightweight Johnny Guillen (2-0). Saturday-Southwest Showdown atAlpha Athletics & Event Center. Doors open at 6:00pm with fights starting at 7:00pm. Tickets are available at Alpha Athletics & Event Center located at 480 Talbot Ave. Suite E. Canutillo, TX, 79935. Ticket Pricing: General Admission $20, Ringside $30, & VIP $75 (front row seating, private bar in exclusive area & Free Drink Tickets). For more information call (915) 313-1944.